Masterson Station Dog Park is located off Leestown Road within Masterson Station Park. This dog park is 15 acres, divided into 2 separate paddocks. There is a water fountain available in each paddock. 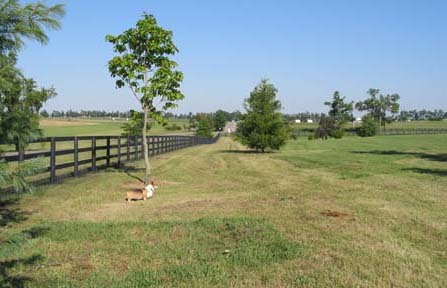 Both paddocks feature mature trees & installed benches. This was Lexington’s 2nd dog park. It was originally an unfenced area running alongside Leestown Road in Mastersson Station Park. We worked hard to raise money to create a safe, fenced environment for the dogs. In July 2003, the first phase of the new dog park area was completed. This included a full 6 acres with mature trees, all enclosed in a horse-farm style fencing with mesh backing. In April 2006, a hydrant was added to provide fresh, cool water on those hot summer afternoons. The second paddock was fenced in July 2010, bringing the total fenced area to 15 acres! A hydrant was installed in the paddock shortly afterwards. Take Exit 115 (Newtown Pike). Turn south onto Newtown Pike. Continue on Newtown Pike for a few miles until you reach the on-ramp for New Circle Rd. (Highway 4). Turn right onto New Circle Road. Continue on New Circle until you reach the Leestown Rd. Exit. Take the Leestown Road Exit, turning right at the bottom of the ramp onto Leestown Rd. Continue down Leestown Road until you see Masterson Station Park. It will be on the right side of the road. Turn right into Masterson Station Park & follow the small signs leading to the dog park. It’s located right past the fairgrounds, on the left. You’ll take a sharp turn to the left (the black horse-farm style fencing on the left is the dog park). The entrance to the dog park is at the end, right before the road takes another sharp turn to the right.